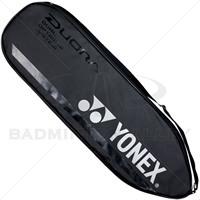 Yonex has combined their famous DUORA 10 professional badminton racquet, designed for heavy hitters, with a lighter frame and a softer hitting feel to create the all-new DUORA 10 LT. The DUORA 10 is well-known for its uniquely constructed frame, which combines a front designed for powerful smashes with a back built specially for drives, allowing heavy hitters to make quality shots from all over the court. Some of the world s top players have won the highest levels of competition with the DUORA 10, such as Kamilla Rytter Juhl of Denmark. In response to many players who expressed their interest in trying the DUORA 10 but were most concerned with weight and shot feeling, the DUORA 10 LT uses the shock-absorbing material VIBSLAYER CARBON to reduce vibration to the wrist and elbow, while maintaining the resilience of the frame that the original is well known for. 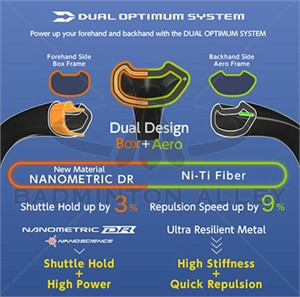 The 10 LT is also lighter to help increase the speed swing and reaction and more maneuverable at 83g (4U) compared to 88g (3U) for the 10. Aggressive performance, combined with a softer touch and increased ease of use from a lighter frame weight, is certainly not limited to women. A broad range of players, including juniors and seniors, will be able to enjoy the DUORA 10 LT. The DUORA 10 LT also incorporates a nickel-titanium fiber on the back side of the frame, which helps the frame maintain its shape and rigidity.